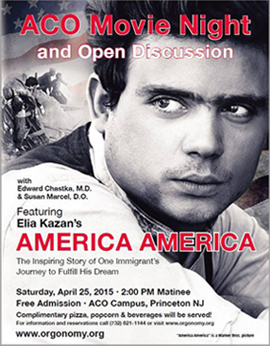 ACO Movie Night & Open Discussion featuring America America - with Edward Chastka, M.D. and Susan Marcel, D.O. Loosely based on the early life of Kazan's Greek immigrant uncle, the film is set in the 1890s and tells the story of Stavros (played by the handsome Stathis Giallelis), a young Greek whose father gives him all of the family's money to make the long journey from their impoverished small village to Constantinople for the promise of a better life working for his uncle in the carpet business. Stavros' own dream is the faraway land of opportunity, America, and he sets out to make getting there his reality. His hopes are soon compromised by casual cruelties, betrayals, and other setbacks although he forms strong and lasting friendships along the way that help him weather the worst. "America America" is a timely portrayal of the struggle for human freedom and emotional health in the face of infectious evil, and the story is as applicable today as it was in the 1890s, the setting of the story, or the 1960s when the film was made.